Oh my god, this looks so good, no bad words for this wall. Absolutely stylish. I agree it has a pretty cool style and it fits well with the scan. Maybe I'd like to see more dark grunge spot in the back, something to try. Beside that the composition overall looks great and looks pretty complete. WOAH bloody awesome because it looks so iconic and like a great mural newpaper drenched in bloody cool texts! Love the composition and movement of the text! Hi Nice Wall. :) You raelly did a great job on this one. Do you understand the Japanese you used in this wall? Well, just wondering. 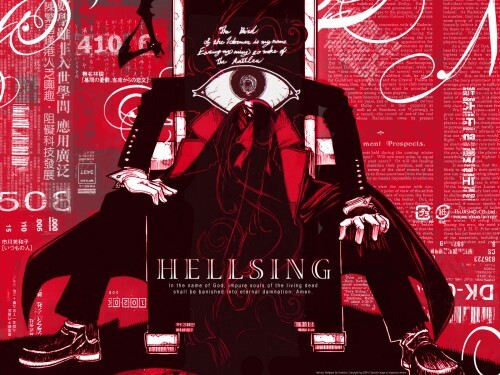 Hehe, this looks like it would be a cover to Hellsing manga ^-~... it's a bit bright, but it kinda fits the wall x3... well... a really good job~! this is so dark and deep. cant say no to that!! greta wall. fave time! !